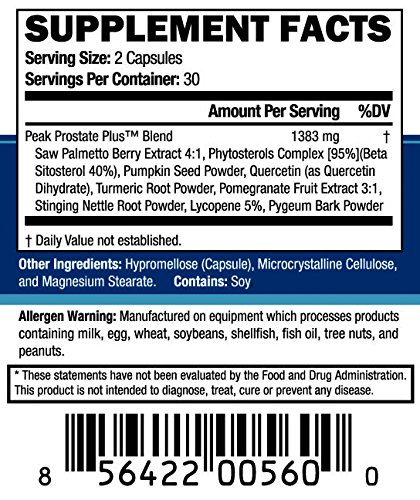 Peak Prostate Plus did a very good job in the lab test getting a nice 262 mg of sterols per dose of which 121 mg of those sterols were from Beta-sitosterol. This is rock solid and can help you. In addition to the nice sterol mix the formula also has some very smart ingredients including quercetin, pomegranate extract and turmeric root. These three ingredients are not found in most prostate supplements because most are filled with worthless saw palmetto, pygeum and Lycopene. This is a smart formula. It has a few unnecessary ingredients in the formula, but they are in minor levels and the sterols count and the three key ingredients I mentioned above lets you know this is a very good product.